Frogs are such curious and interesting creatures that it is no wonder so many children are fascinated by them. 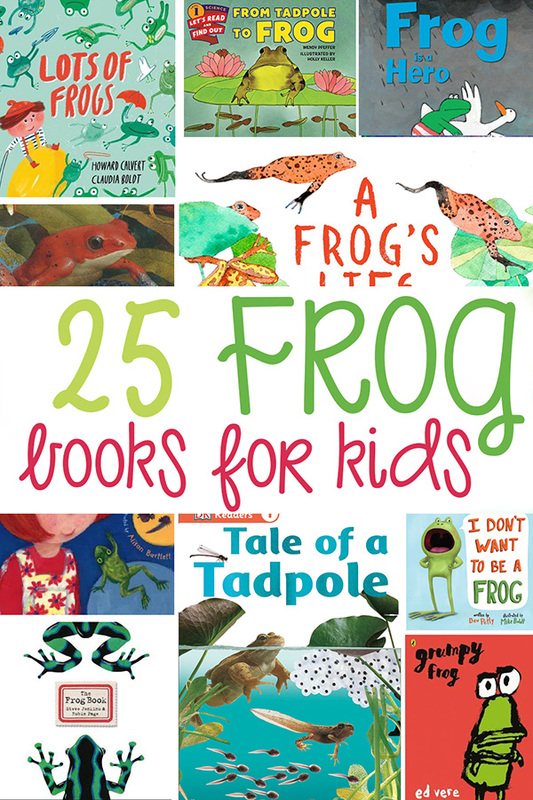 Today I’m sharing a collection of fabulous frog books that are perfect for frog-loving preschoolers, kindergarteners and elementary aged children. 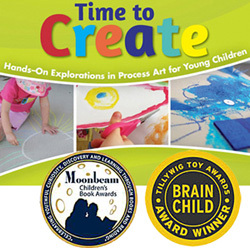 The list includes picture books starring frogs and informational texts that offer non-fiction information about frogs in a child-friendly format. 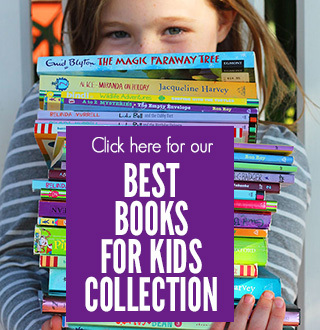 RELATED: Be sure to check out our complete collection of collated book lists over at our Best Books for Kids page. 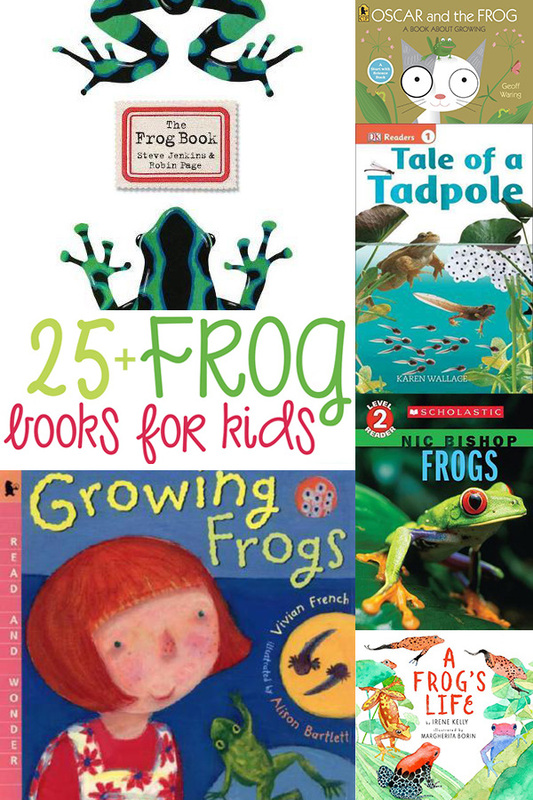 Whether you currently have a frog-obsessed kid, or are simply looking for a collection of frog books for kids to go with a unit study about frogs… you’re sure to find some new favorites to love! 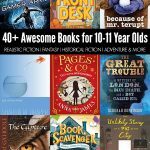 Each title is linked to both Amazon and The Book Depository (these are affiliate links) where you can find reviews and age recommendations for those you are not personally familiar with. 1. 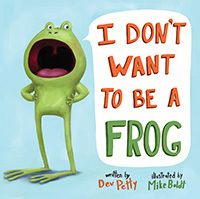 I Don’t Want to Be a Frog by Dev Petty: Teaches kids to be happy with who they are with this funny book about frogs. This frog learns to love the skin he is in by the end of this very silly story. Kids will be laughing to tears by the end! 2. Oi Frog! by Kes Gray: One of the funniest picture book series we have ever read! “It’s very simple, really. Cats sit on mats, hares sit on chairs, mules sit on stools, gophers sit on sofas, and frogs sit on logs.” But Frog does not want to sit on a log! We love it, as well as the other titles in the series: Oi Dog!, Oi Cat! and Oi Duck Billed Platypus! 3. 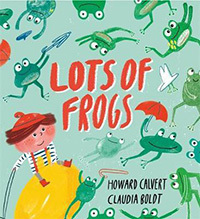 Lots of Frogs by Claudia Boldt: Tommy Fox has a box – a box full of frogs. And when they all jump out at school, that’s when the fun begins! There is chaos in the classroom and high jinks in the hall. Can Tommy get the frogs back in the box? 4. 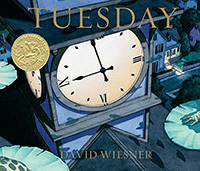 Tuesday by David Wiesner: The whimsical account of a Tuesday when frogs journeyed airborne on their lily pads is positively enchanting for readers of all ages. 5. 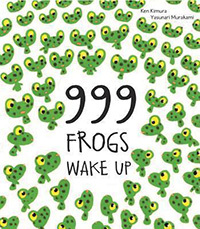 999 Frogs Wake Up by Ken Kimura: As Spring arrives 999 young frogs awaken, they panic to find that all of the other animals are still asleep. First they wake the biggest frog, then the tortoise, the lizard, and the ladybugs. But what happens when they awaken snake??! 6. 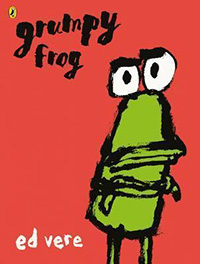 Grumpy Frog by Ed Vere: Grumpy Frog is not grumpy. He loves green, and he loves to hop, and he loves winning. But what happens when Grumpy Frog doesn’t win, or encounters a PINK rabbit?! A fabulous story about compromise and tolerance, friendship and the power of saying sorry. 7. 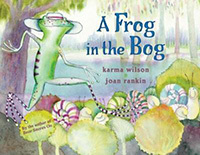 A Frog in the Bog by Karma Wilson: A hilarious, rhyming story with lots of repetitive verse that invites younger readers to join the story. 8. 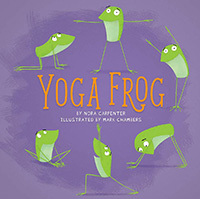 Yoga Frog by Nora Shalaway Carpenter: Frog loves to practice yoga. And he will inspire kids to enjoy doing yoga, too as they follow Frog’s yoga flow all the way from warming up to cooling down. 9. 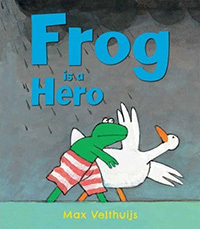 Frog is a Hero by Max Velthuisj: When the rains come and the river floods the area, Frog, Duck, Pig and Hare are stranded, Frog decides to swim across to the hills to find help for his friends. A title from the wonderful frog series by Max Velthuisj. 10. 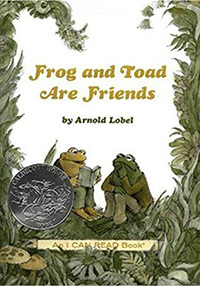 Frog and Toad are Friends by Arnold Lobel: From writing letters to going swimming, telling stories to finding lost buttons, Frog and Toad are always there for each other—just as best friends should be. 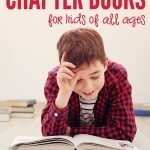 Five adventure stories for early readers to enjoy. You can also find the complete Frog and Toad collection via The Book Depository and Amazon. 11. 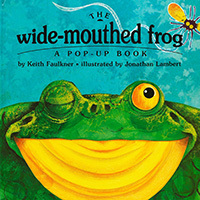 The Wide-Mouthed Frog by Keith Faulkner: The fabulous story and fun pop-up features of this titles is sure to catch the imagination of young readers! The wide-mouthed frog is super curious, talking to all the other animals about what they like to eat – before he meets one who likes to eat wide-mouthed frogs! 12. 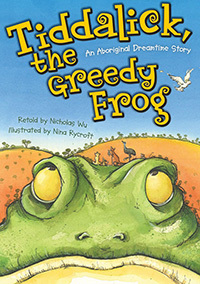 Tiddalick, the Greedy Frog by Nicholas Wu: Kids will have so much fun learning all about sharing with this fun and delightful book! Tiddalick won’t give back the water until his friends team up together to finally get him to share. 13. 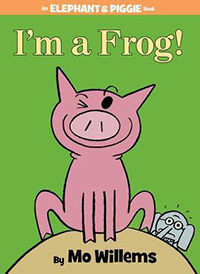 I’m a Frog by Mo Willems: Piggie has some ribbiting news! Can his best friend Gerald make the leap required to accept Piggie’s new identity? 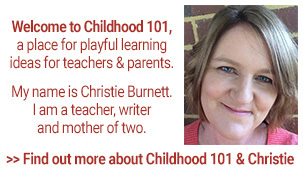 A fun lesson in imagination that will have your children hopping with laughter. 14. 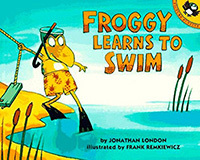 Froggy Learns to Swim by Jonathan London: Froggy is back as he learns to swim! Kids will love this fun story as they watch Froggy go from scared of the water to a champion swimmer! 15. It’s Mine! 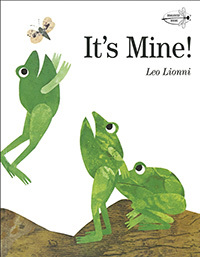 by Leo Lionni: A GREAT story for kids all about sharing – featuring bickering frogs who learn sharing is more fun. 16. 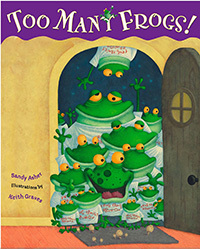 Too Many Frogs by Sandy Asher: A fun read-aloud story for kids, featuring colourful illustrations, a gentle message, and lots of kid friendly humor. This will become a new favorite with ease! 17. There’s a Frog in My Throat! 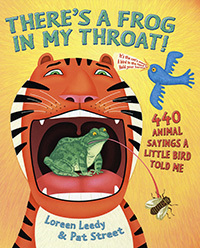 440 Animal Sayings a Little Bird Told Me by Loreen Leedy: Introduce your child to the fascinating world of idioms with this fun book full of animal sayings. 18. 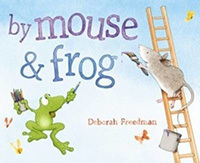 By Mouse and Frog by Deborah Freedman: Fastidious Mouse has one idea about how to tell a story. Free-spirited Frog has another. What happens when Frog crashes into Mouse’s story with some wild ideas? Chaos! 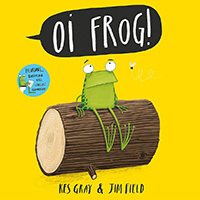 These non-fiction frog books are great for kids with interesting informational text suitable for children, some shared in a story-like format. 19. 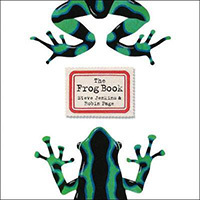 The Frog Book by Steven Jenkins & Robin Page: We love Steve Jenkins so much that his books feature on quite a number of our Best Books for Kids lists! The soon to be released The Frog Book looks just as wonderful and engaging – long legs, sticky tongues, big round eyes, and other dazzling features—what’s not to love about frogs? 20. 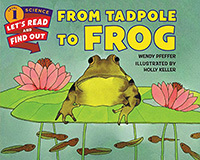 From Tadpole to Frog by Wendy Pfeffer: Learn all about the lifecycle as a tadpole turns into frog in this fun picture book! This book also includes a guide about different species and where they are found. 21. 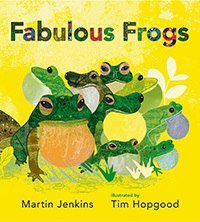 Fabulous Frogs by Martin Jenkins: Curious minds will jump through the pages in this book all about different frogs! This book even talks about a selection of more “unique” frogs in this fun adventure. 22. 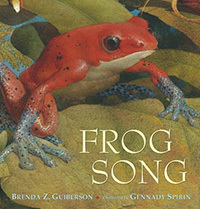 Frog Song by Brenda Guiberson: Onomatopoeic text and stunning illustrations introduce young readers to these fascinating and important creatures and the unique noises they make, with frogs from Chile to Nepal to Australia. 23. 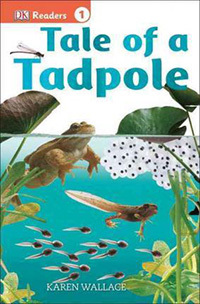 Tale of a Tadpole by Karen Wallace: Follow the life of a newborn tadpole as he hides from the dangers of the pond including hungry goldfish and beetles, and grows up into a frog. A DK Readers Level 1 book. 24. 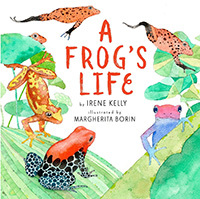 A Frog’s Life by Irene Kelly: This book will introduce more advanced information and concepts about frogs to kids. Learn all about different species, the foods they eat, their body types, and so much more. 25. 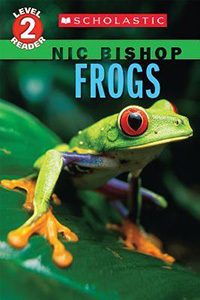 Frogs by Nic Bishop: Join Sibert Medal-winning photographer and biologist Nic Bishop as he takes a closer look at the world’s most amazing animals, introducing fun facts about frogs and their bodies, habits, and life cycle. 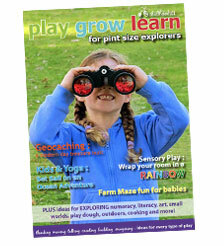 A Scholastic Reader Level 2 title. 26. 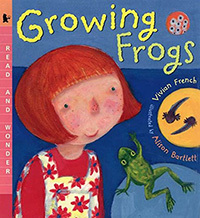 Growing Frogs by Vivian French: Great introduction for preschoolers to learn how an egg turns to a tadpole and how a tadpole turns to a frog. 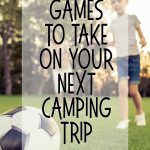 Fun illustrations included to get kids excited! 27. Oscar and the Frog by Geoff Waring: This series is great at teaching kids about different science aspects in a fun way! Colorful illustrations are paired with a story about how things grow in this fun book! 28. 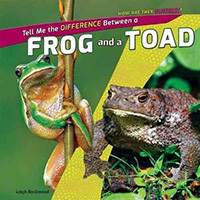 Tell Me the Difference Between a Frog and a Toad by Leigh Rockwood: Learn all the ways in which these two amphibians are alike and different.